Spring Hill a suburb in inner Brisbane was not only the birth place of Eric Henry Williams, but of both his parents as well, who owed their beginnings to English and Swedish heritage. He was a very quiet, gentle and reserved person who never spoke about his early life, but it is known that he was born the 15th May 1909, the second son and fifth child in a family of eleven children. The family was well known in the area where he spent his childhood and teenage years. From an early age he and two of his sisters showed their prowess at the local swimming baths. An exhibition match was arranged between him and Johnny Weismuller (Olympic champion and later star of the “Tarzan” movies.) He did not win but put in a creditable performance, which resulted in an offer to be taken to Sydney to train for the Olympics. Unfortunately, this offer was unable to be taken up. His schooling was at Leichhardt Street State School until seventh grade. His first job was as an apprentice type setter. Returning from his employment one evening, he alighted from a tram, and became one of the first people in Brisbane to be hit by a car. When not working he enjoyed an active social life, while continuing with his swimming and later boxing where he displayed talent and determination in the ring. Prior to and after his marriage in 1932 and the births of three sons, he was engaged in diverse varieties of employment, including rope and wicker worker, baker, concrete worker, and stone pitcher in gangs building and trenching stone walls. 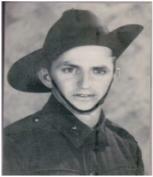 July 1940 saw him enlist in the Army at Kelvin Grove. Later as a member of the 2/26th Battalion, he trained at Grovely, Redbank and Bathurst and departed for overseas duty in July 1941 aboard H.M.T. ‘EE’ – Marnix Van Sint Algdegonde. He arrived in Singapore on 15th August 1941. Taken prisoner with many thousands of others at the Fall of Singapore, he spent time in Changi, from where, in April 1943, as a member of “F” Force he was sent to slave on the construction of the Thai-Burma railway. He arrived back in Changi in December of the same year. After the Japanese surrender, Lord and Lady Mountbatten visited Singapore. He was one of a relatively few P.O.W’s selected to be part of a guard-of-honour formed for this occasion. He arrived back home in October 1945, aboard the “Largs Bay”, and after rest and recuperation time spent at Burleigh Heads on the Gold Coast was discharged from the Army in December 1945. As his strength and health returned, he was employed as a Painter and Docker on the wharves at South Brisbane for a short time. After selling the fruit shop and prior to the birth of another daughter in 1949, a move was made to Cannon Hill, where he found employment as a Signalman, in the Railways. Eventually, he was transferred to South Brisbane Railway Station, then Interstate Railway, where he worked as a porter and ticket collector. Conditions endured on the Thailand-Burma Railway were blamed for his continued bad health. He was continually plagued with Bronchitis and other chest ailments. He loved fishing and his greatest joy was when he was wetting a line. Most Friday nights would see him down behind the meatworks at Cannon Hill fishing from the rock walls. Frequent weekends and most holidays were spent at Amity Point at Stradbroke Island. In October 1964 he was diagnosed with cancer and had his first operation shortly afterwards. He was given about two years to live. He spent most of the next few months pottering about and when ever possible over at Stradbroke fishing. Over a period of time, as cancer invaded nearly all of his body, he underwent many more operations until finally he was unable to even leave his bed, let alone go fishing. As time progressed increasingly more and more time was being spent in hospital. His last trip home was towards the end of August 1966. He passed away in his sleep five days later from the effects of a Bronchial infection he had contacted three days previously.